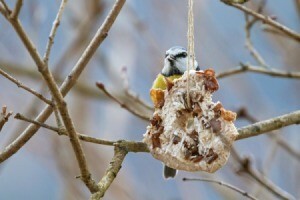 Make a totally edible bird feeder for your winter visitors using a lard and seed covered bagel. This is a guide about making a bagel bird feeder. Don't forget our birds this winter. They need food! Spread entire bagel with lard. Place birdseed on a paper plate. Roll the bagel in the birdseed. Tie jute or string through the hole of the bagel to hang the bagel. The birds can eat the whole thing!